Please feel safe to shop at our SECURE online 24/7 stores. You will receive an Email Order Confirmation once your order is placed. You will receive an Email Notification once your order is processed. You will receive your tracking number via email once your order is shipped. Please call us at 1-866-890-5105 to place a phone order. Please scroll down to the bottom on the checkout step. 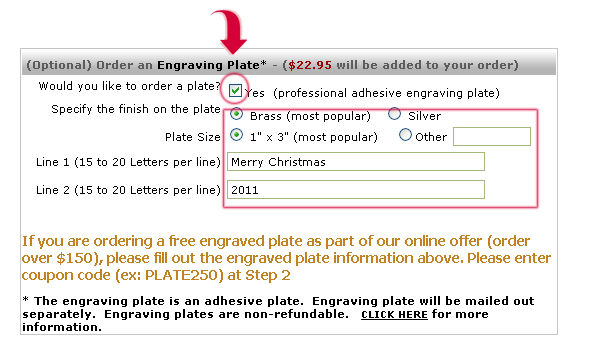 You will see "Order an Engraving Plate" option box (see below). Please check the box "Yes", and the engraved plate $22.95 will be added to your order. Please select the finish, size of the plate. 2 lines. 15 to 20 letters per line. This is a self-adhesive plate, so you can adhere the plate to the proper location on your product. The plate will be shipped separately. Normally, it will be shipped around 7 to 15 business days. The plate is not returnable or refundable. Click on "Continue" to go to Checkout Step 3 to enter the coupon code (ex: PLATE250) if your order is qualified for a free plate. To read more about our free engraved plate offer, please CLICK HERE. If you have any questions, please call Sales at 1-866-890-5105. Please click on each link below to order Our Cerfiticate. Checkout page 3: Enter the Certificate or Coupon Code in the box: "Redeem Coupon (if applicable)". Click on "Apply"
We also accept cashier's checks, money orders, personal checks and company checks for domestic US orders. - Money Order, Casher's Check - Orders will be processed within 3 to 5 business days once checks are cleared. - Personal and Company Checks - Orders will be processed within 5 to 7 business days approximately once checks are cleared. Please email us your purchase order. To obtain our email address for purchase order, please call us at 1-866-890-5105. Or please fax your purchase order at 818-660-2591. What Does Easy Payment Plan Work? Please click here to read more information. Due to our commitment to process orders quickly, once the checkout process is complete, we immediately submitted your order to our order processing team; We regret that we can't cancel any orders once we receive your orders. If you'd like to return your item, please refer to our return policy. Our goal is to provide the most pleasant shopping experience. However, due to high daily sale volume, some "in stock" items might be sold out at the time we receive your order. You will be notified promptly via email of the back order and expected time of shipping. We do NOT share our customer information with any 3rd parties beyond what is required for a normal order transaction such as order processing and shipping. FREE GROUND SHIPPING in the U.S. Contiguous 48 States*! *Free shipping is not available in Hawaii, Alaska, Puerto Rico, Virgin Islands or Canada. We do not ship Seiko products and most products to outside of the U.S. For international orders, customer is responsible for all import duties due to your government. Shipping charges may apply to some products under $30 or some oversized products. FREE SAME DAY PROCESSING + FREE QUICK SHIPPING! We strive to ship your orders as quickly as possible. We provide "FREE" Same Business Day Order Processing for most orders. Most orders will be entered in shipping within 24-48 hours - "SAME BUSINESS DAY" or "NEXT BUSINESS DAY"*. We ship most of our products via UPS or FedEx ground. Once shipped, it will take an additional 1 to a few business days to deliver. The calculated ship timeframe does not include the date the item was shipped out. For example, if 2nd day air is selected and item is shipped on Monday, the item will not deliver until Wednesday - Monday is not considered in the ship timeframe. For grandfather clock or furniture item delivery, please click here to read more. Occasion date on your order (if you indicated) is only for reference only. We are unable to guarantee that you will receive your order by the occasion date. We provide FREE ground shipping for most areas. We always strive to ship your orders as quickly as possible. Please understand that we are unable to guarantee any ship dates or delivery dates for free ground shipping services that we offer. The shipping business days are from Monday through Friday except holidays. If you need to receive your order by a certain date, we recommend you to ship your order via Air shipping (Expedite your order). For custom made products, it will take at least 5 to 8 business days to ship. Custom made orders cannot be cancelled or returned. For globe items, some globes will be shipped directly from the manufacturer. Some globes are made to order and may take at least 3 to 5 business days to ship approximately. Please click on "Track" link on the top right corner on our site to view the status of your order online. Please type your billing email address (case is sensitive) and your order number. Please click here to submit request if you have any further questions or you cannot find your order. For security reason, the tracking information can only be provided online or via email. Thank you. Rush or Air Shipping Charges - you can look up the air shipping charges for the product shipping to your location on the payment/shipping selection during checkout step 2. If you have any questions regarding our AIR RUSH SHIPPING charges, please call our sales at (866) 890-5105. From time to time, we may have special air shipping charges offers to our customers. We can expedite your order via Next Day Air, 2nd Day Air or 3rd Day Air, where available. Most air rush orders will be immediately processed and will be shipped next business day (or 24 to 48 hours approximately). The Regular shipping business days are from Monday through Friday. Air shipping services not available for Grandfather/Floor clocks or large furniture items. Most of our products may require some assembly and adjustment. For open-faced clocks where the hands are not covered by a lens, the hands are sometimes required to be adjusted. Hands that are loose, or require slight adjustment (require slight bending) are not considered defective. Please click here to submit request to request tech support if you have questions regarding how to adjust hands. If you think that you received a wrong item, please click here to submit request within 5 business days of receipt of product. If you would like to request IN-HOUSE SETUP for your grandfather clock, please click here to submit the request. Step 2) Receiving an RMA# via Email : If your item is qualified for return or exchange, RMA# will be emailed to you within 3 to 7 business days once a return or exchange request has been received. Step 3) Returning Product with an RMA# : Please print the RMA and follow the instructions on the RMA to return your item. All items must be returned in original condition, including the original packaging, containers and all documentations. For watch returns: If watch item(s) have been worn, used, scratched or plastic covering lenses have been removed, it cannot be returned. All merchandises properly returned are eligible for a refund, which credit to the original payment method or a store credit will be issued. The refund or store credit will be processed within 15 to 20 business days approximately once your return item(s) is received and also inspected. If the item has been delivered to the return address on the RMA over 15 business days and you would like to follow up the refund, please click here to submit request. We are the Authorized dealer for all products we sell. All products we sell are AUTHENTIC and carry a manufacturer's warranty. All products we sell have been tested prior to leaving the manufacturing facility. If you would like to obtain the manufacturer's warranty contact information, please click here to submit request, and we will be happy to provide you with the manufacturer's warranty contact information. The key-wound clock has a mechanical movement. Normally, you need to wind the clock every 8 days or 14 days. Most of key-wound clocks have chimes and/or strike on the hour. Most of key-wound clocks have chime & strike silent feature. 4/4 Chimes - it means that the clock chimes every 15 minutes. These clocks are operated by batteries. Some quartz clocks have chimes and strike on the hour. Some of them do not have chimes and strikes. Cuckoo one day the chain hangs down around 71" and must be pulled all the way to function for 24 hours. 1 day cuckoo clocks need to be wound by pulling up the weights once per day. The cuckoo calls once on the half hour and the full hour on the hour. All our Black Forest Cuckoo Clocks have a night shut-off switch. Weights and pendulums are sometimes not shown in pictures but are included with all clocks. All our Black Forest Cuckoo Clocks are made from wood in German Black Forest. All our Black Forest Cuckoo Clocks are made individually, so each clock will be slightly different from the picture and All-clock-dimensions-are-approximate. 1 day musical cuckoo clocks need to be wound by pulling up the weights once per day. The cuckoo calls once on the half hour and the full hour on the hour. Most of the 1 day musical cuckoo clocks play music after the half hour call. Normally, the musical cuckoo clocks play two nice songs. All our cuckoo clocks have a night shut-off switch. Weights and pendulums are sometimes not shown in pictures but are included with all clocks. All our cuckoo clocks are made from wood in German Black Forest. All our cuckoo clocks are made individually, so each clock will be slightly different from the picture and All-clock-dimensions-are-approximate. 8 day cuckoo clocks need to be wound by pulling up the weights every 8 days. The cuckoo calls once on the half hour and the full hour on the hour. All our cuckoo clocks have a night shut-off switch. Weights and pendulums are sometimes not shown in pictures but are included with all clocks. All our cuckoo clocks are made from wood in German Black Forest. All our cuckoo clocks are made individually, so each clock will be slightly different from the picture, and All-clock-dimensions-are-approximate. 8 day musical cuckoo clocks needs to be wound by pulling up the weights every 8 days. The cuckoo calls once on the half hour and the full hour on the hour. The 8 day musical cuckoo clocks play music after the full hour call. Normally, the musical cuckoo clocks play 2 or 3 songs. All our cuckoo clocks have a night shut-off switch. Weights and pendulums are sometimes not shown in pictures but are included with all clocks. All our cuckoo clocks are made from wood in German Black Forest. All our cuckoo clocks are made individually, so each clock will be slightly different from the picture and All-clock-dimensions-are-approximate. Quartz cuckoo clocks operated by batteries. You don't need to pull up the weights every day or every 8 days. The cuckoo calls on the hour. The quartz cuckoo clocks come with chains and weights. They have volume control. Weights and pendulums are sometimes not shown in pictures but are included with all clocks. All our cuckoo clocks are made from wood in German Black Forest. All our cuckoo clocks are made individually, so each clock will be slightly different from the pictures. All-clock-dimensions-are-approximate. Body Height (Clock Body Height): This the height from the very top of the clock body, i.e. the very top of the bird, or antler of a deer, to the very bottom of the clock body, ie. the very end of the leave, or nest, or any carving part. Height (Overall Height): This is the clock body height with the length of the pendulum included, usually 4 to 5 inches longer than the clock body height. All cuckoo clock dimensional information (heights, widths and depths) are approximate since they are hand carved. All dimensional information (heights, widths and depths) for our products are approximate, especially those for hand carved products such as cuckoo clocks. The exact dimensions of the cuckoo body carvings can vary 1 to 3 inches since each is hand carved. If a dimension (a height, width or depth) is less than the approximate dimension indicated in our product description, this does not constitute a defective product or an incorrect model. Actual color or finishes may vary from product photography shown on this web site. Note: Our prices and product specifications are subject to change without notice. Actual chimes may vary from chimes reference listed on our web site. Our prices, product specifications and policies including return & exchange policies are subject to change without notice. Customers agree our current posted policy for return or exchange. We do our best to provide you with the most accurate and current information on our website. When typographical errors occur and we become aware of this we will correct the information immediately. Errors in discounts, pricing, stocking etc. will not be honored. We will continually and consistently strive to provide the most current and accurate information on a consistent basis.